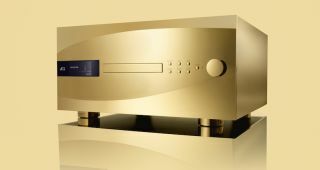 Vivaldi One by dCS - yours for £66,000 (including 24-karat gold plate) | What Hi-Fi? As part of its celebration of its 30th anniversary dCS' Vivaldi One player can stream music from NAS drives, Tidal, and Spotify. As part of its celebration of its 30th anniversary dCS is releasing 250 of a new limited edition digital music player, the Vivaldi One. Combining a CD/SACD transport, Ring DAC, upsampler, and network streamer in one box, the Vivaldi One is capable of playing PCM input up to 24-bit/384kS/s, DSD files up to DSD128, or in a DoP (DSD over PCM). That last one’s a format invented by dCS in 2011 to packet DSD data as PCM and make it transferable over 24/192kHz USB, AES, and S/PDIF digital inputs interfaces. For wireless playing, the Vivaldi One can stream music from NAS drives, or online streaming services like Tidal or Spotify - Spotify Connect over Ethernet. For Apple devices, the One has support for Airplay too. But what might set the Vivaldi One apart from other players is how it looks – or rather, how you could make it look. The standard black and silver finish will set you back £55,000, but for between £2500 and £11,000 you can get a rhodium, nickel, and chrome finish (the price depends on the finish) while the full £11,000 will get you the 24-carat gold plating pictured above. If you want to get your hands on one, it’s available this month, having made its debut in May at the Munich High End Show.